Why do people get censored? I make a post with constructive criticism and what happens? I get banished to the goulag. My post was a direct reply to a question asked on the thread. What makes that off topic? Nothing, they just didn’t like my post because it was true. The real irony here is the person who moved my post just reinforced my point. Does this forum not allow any dissent or disagreement? How is it decided who can move and or delete posts? What was your reply referring to? I don’t see how it is related to anything in that thread. Unfortunately, if the threads are not kept on topic, they get very difficult to read and it can happen fairly quickly. The mods do a good job of moving posts that aren’t relevant (it’s their judgment) to the off-topic thread. Imagine a thread with thousands of posts (there are several here) that included people arguing back and forth about minutiae. It would be a mess. As far as differing opinions and “dissent”, you should go through more topics as there is plenty of that still here if it’s on topic. Trying to trace it back, looks like you were replying to @RJain’s post. He posted his ad in another dealer’s Marketplace thread. How do you think that is proper? 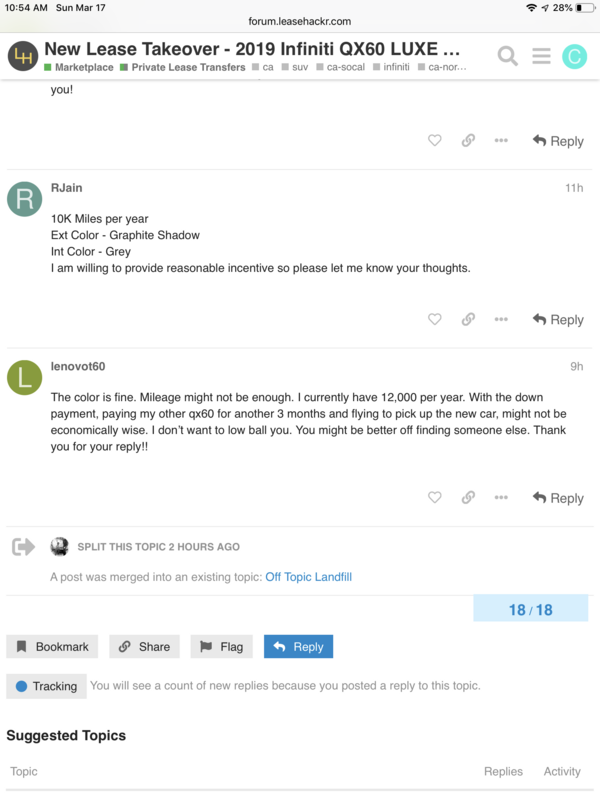 “I created a new topic … not sure how it is added to some other thread. To which I replied the comment above that got me banished. He didn’t it was in a separate thread and got merged by someone into that post that is why he said he had opened a separate thread and wasn’t sure how it got into that thread. Wo which I replied my comment. You are incorrect. He did make a post in this thread below, which resulted in it properly getting moved. You can check my history. I have read tons of posts over several months. Allow me to clarify. Dissent over opinions pertaining to cars is fine. This was directed to the way threads are moderated and I was removed rather than someone having a pertinent response such as what you are doing. It got moved where? Into someone else’s thread, correct? Regardless my reply was to a comment another user made and was not off topic. I understand the need to moderate the forum. Their are trolls all over. However this post was not trolling or off topic and was moved because the person moving it did not like what I had to say. That is censorship. You are making all these complaints and it isn’t even valid. 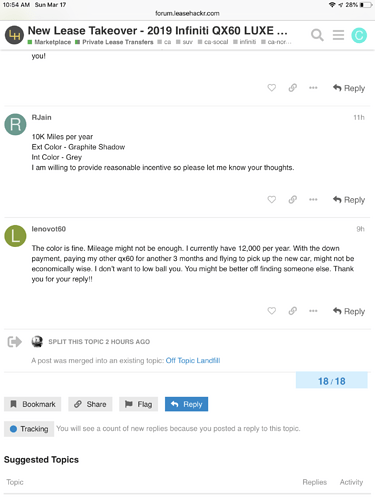 @RJain made 2 exact posts (one was a new thread and one was a post in the other broker’s thread). His post in the other broker’s thread (along with the 3 replies) were moved into the landfill, then merged into his original thread. You are completely missing my point. I am not defending @RJain. I see what you are saying I was mistaken as to what I thought had occurred to him. However my original point which is what I stated form the beginning is my post was on topic and was removed simply because someone didn’t like what I had to say. I have never been on a site where random users can just move and delete anyone’s posts because they don’t like them. YOU ARE MISSING THE POINT. How is your point on-topic? I don’t see it taking about a QX60. It was answering a question asked on the thread, which happens all the time. That’s exactly why it was moved. Irrelevant on all fronts. I see what you are saying I was mistaken as to what I thought had occurred to him. However my original point which is what I stated form the beginning is my post was on topic and was removed simply because someone didn’t like what I had to say. I’m not sure how you can say you were mistaken and on topic at the same time. 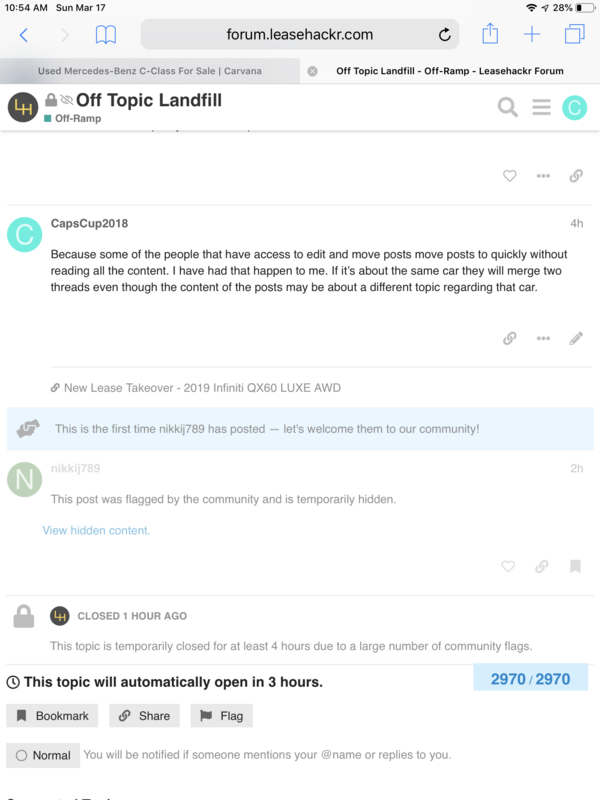 Lemme get this straight… Your post was CLEARLY MOVED to a different part of the SAME GENERAL FORUM, and you are complaining about censorship? Get over yourself and get a life. We try to be as hands off as we can, only moving things that are truly off topic or in the wrong place. 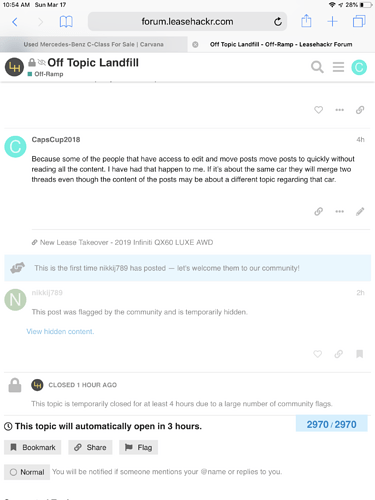 My personal experience is that the moderation of leasehackr is far less intensive than any other board I participate on where there is zero latitude for off topic discussion. We give folks here a lot of room before we lean in. That said, we will never make everyone happy. We do our best. It was moved to the off topic dumping ground. Not to the same general forum. Why would you use ad hominem attacks? I am trying to have a civil discussion no need for your condescension especially when you have your facts wrong. That’s a valid point. I can be more careful in the future.However I believe my point is valid. My main area of contention is how is it decided who gets the power to move and delete posts? Understood and I appreciate your feedback. Perhaps a note to the person who was moved or deleted, even if it’s some kind of form letter so we can learn why the post was moved?